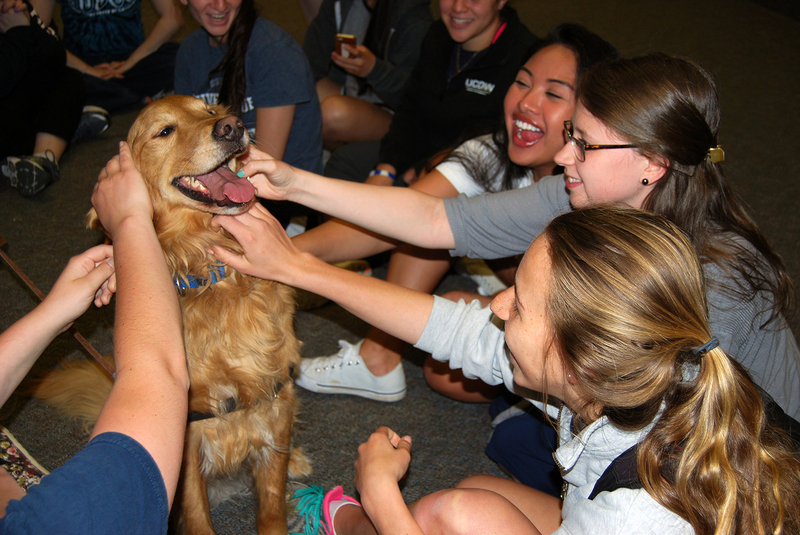 Paws to Relax returns for finals week! You may be checking out a million articles on Buzzfeed about adorable dogs this finals week, but what is better for easing stress than getting to play with ACTUAL, REAL LIFE DOGS? Paws to Relax understands your struggle, and to help you out they will be on Level 1 of Homer Babbidge Library every day during finals week! The dogs are registered with national organizations dedicated to improving human health through the use of service and therapy. Sick of doing group studying and projects all huddling around a small laptop screen? Head over to the library! 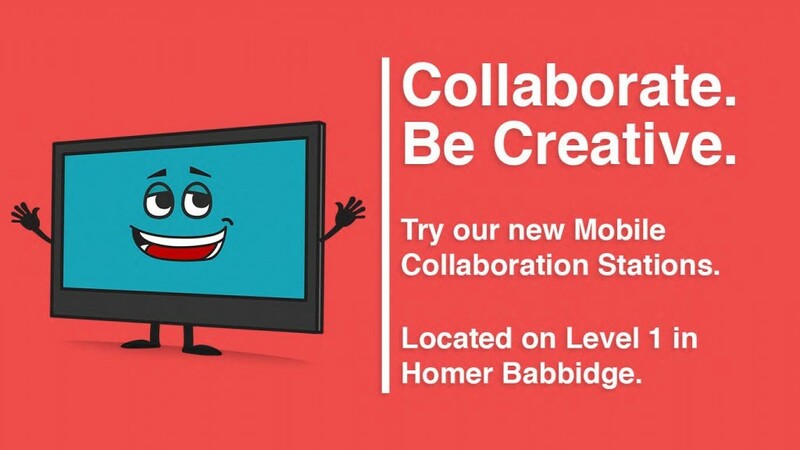 This week, two “Mobile Collaboration Stations” where introduced to Level 1 of Homer Babbidge. These stations, paid for through the student technology fee, consist of a large computer touch screen on a rolling stand that can be transported to anywhere on the first floor. The stations are made to encourage collaboration and convenience. The touch screen is ideal for using the station like a white board or going through presentations or charts with a group so that everyone can see and participate in whatever is being reviewed. Student groups can already be seen rolling one over to their own little corner, or testing out the touch screen white board in their spare time. If they do not want to utilize the touch screen, students can check out a mouse and keyboard from the iDesk on the Plaza Level. At this point, the stations are only available on the first floor and must be returned to their dock by the Q center after use. However, if people find them useful for academics, library staff will consider adding more to other floors. Stop by Level 1 and check them out today- they have arrived just in time for all of your group studying sessions for finals! 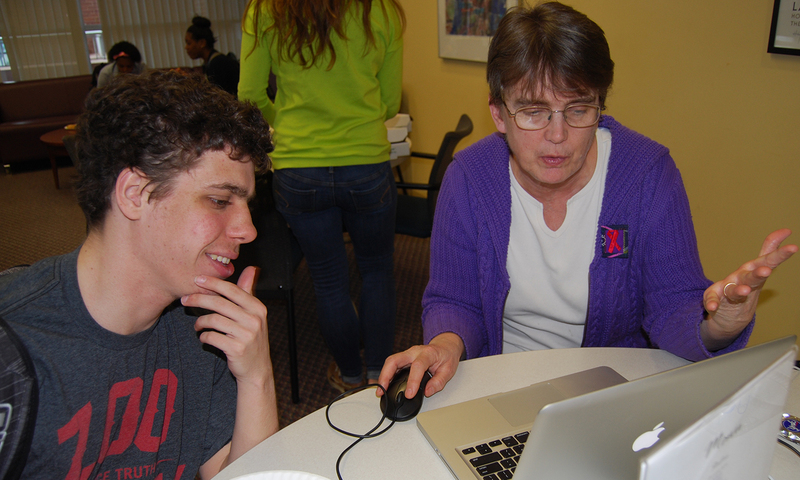 Subject Specialist Kathy Labadorf assists a student with his assignment. As the semester starts to wind down, that scary due date on your syllabus for that final research paper, presentation or other big assignment gets closer and closer. But don’t worry- you don’t have to go through this alone. The library employs “subject specialists” in over 60 subject areas. They can help you with multiple stages of your paper, from choosing a topic to managing your citations. I sat down with Kathy Labadorf, Reference Librarian and the subject specialist for Women, Gender and Sexuality studies, and she informed me of all that she and her colleagues have to offer students. Come in as soon as you get the assignment. Kathy’s most important piece of advice? Don’t wait until the last minute. As soon as you have the specifications for the assignment, come see a librarian. They can conduct what is called a “reference interview” with you where they can ask questions to help you specify or narrow down your topic. “We want to get you to a place where you have something to start with,” she said. Find out where to look. Since the librarians hand pick a lot of the databases and sources that the university offers, they can easily make connections between different information sources to help you find research to support your topic. They know which databases will be good for you and can help you with keywords and search tips. They are constantly searching for new information and are happy to share their findings with you. Find out which sources you should trust. The subject specialists can also help you to evaluate the sources you find. They teach “information literacy” to students to help them learn how to identify things like bias, timeliness and authority that can distinguish a good reference from a bad reference. Kathy and the other specialists also recognize that you may need some non-scholarly sources as well. “These can bring in different perspectives. For example, a lot of information and statistics about women come from data from different NGO’s,” she said. The librarians can help you evaluate the legitimacy and value of sources like these. Kathy will often do exercises with students like “mind maps” to strategize the organization of research papers. Did you know that you can chat online with a librarian? If you have a quick question, or don’t want to trudge through the snow in the winter to the library, UConn librarians are available to chat on the library website to discuss any questions you may have. If the chat is offline, you can also consult the searchable FAQ, call the library, or send an email. So if you have a big assignment and don’t know where to start, the subject specialists can help. They are located on the first floor of the library- stop by today! 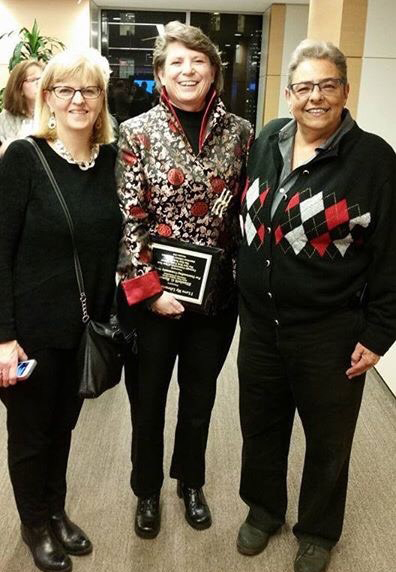 Our own Beth Rumery, library director for the Avery Point Campus Library, received the I Love My Librarian Award for her outstanding public service to the community and ongoing commitment to transforming lives through education and lifelong learning. Rumery was one of only 10 librarians within the United States recognized this year for this esteemed honor. As part of the award process, library users nationwide are invited to nominate their favorite librarians working in public, school, college, community college and university libraries. This year more than 1,300 library patrons submitted detailed stories showing how their librarian had an impact on their communities and lives by connecting people with the information access and critical resources they need to succeed in today’s digital age. The American Library Association (ALA) is the oldest and largest library association in the world, with 58,000 members in academic, public, school, government, and special libraries. The mission of the American Library Association is to provide leadership for the development, promotion and improvement of library and information services and the profession of librarianship in order to enhance learning and ensure access to information for all. The ALA administers the I Love My Librarian Award through the ALA’s Public Awareness Office which promotes the value of libraries and librarians. Have you ever seen a husky wearing a firefighter costume? How about running shoes? What about painted with binary code? Stop by Homer Babbidge Library and you just might. 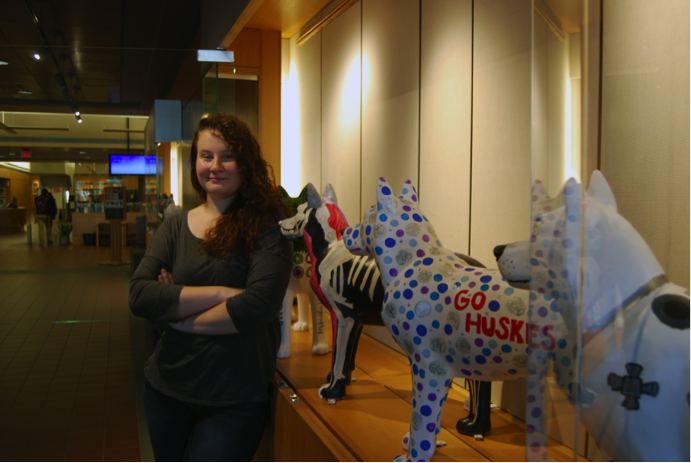 Last week, it debuted its winter exhibit: a collection of husky dog statues painted by various organizations and individuals on campus. The dogs give a visual to the diversity of student organizations here on campus and have allowed some extremely talented individuals to showcase their art. Viewers will be able to vote for their favorite husky with slips located next to the exhibit. Both the artists and those casting ballots have a chance to win gift cards to the Adventure Park at Storrs or Insomnia cookies. Viewers can check out the creative designs, including the Nursing School Class of 2017’s “Jonathan Goodnurse,” UCMB’s “Marching Husky,” and even “Jonathan the RA” by the Residence Hall Association. The mind behind the creative project was Agata Harabasz, a UConn senior and president of the Bean Team, a group that works with the Benton Museum of Art to promote the arts on campus through campus projects, museum trips and art demonstrations. She got the idea from the “CowParade,” where local artists and businesses paint cow statues that are displayed around town. The event occurred in West Hartford in 2007 and has been held in cities around the world. 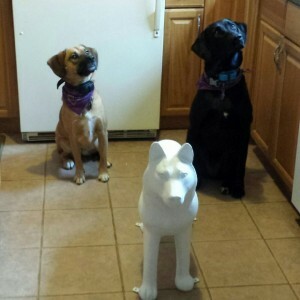 Since UConn already had larger painted dogs in the Co-Op and Student Union, she decided it would be a great idea to bring back the activity as a competition. In September, student organizations submitted designs for their dog, which were then voted on by the Bean Team. The winning groups were given the statues to paint, which were bought from Cowpainters, a company based in Chicago, and funded by USG. The event was a great opportunity for organizations to bond while advertising themselves on campus. 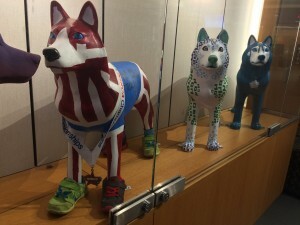 “As a club, we decided that participating in this contest would allow for team camaraderie and increase the scope of awareness in the UConn community of Club Track and Field,” said Christina Cotte, who designed and painted the group’s statue along with two other students, Harry Walton and Adam Gagnon. Club Track and Field’s painted husky statue, on the left. Chris Browne designed and painted the statue for WHUS, and was happy to be able to demonstrate his passion for the organization. Harabasz also got in on the action- she painted the husky representing the Benton, the Beanery and the Bean Team. Besides that, her favorite submission is the “Four Seasons” husky, painted by Patty Guardiani, a member of the library staff. “My inspiration for my design comes from my drive into work everyday and enjoying the beautiful grounds at UConn,” said Guardiani about her design. Guardiani is an art lover with two dogs, so she couldn’t resist getting involved in a competition that combined the two. Although the future of the dogs after the exhibit is not set in stone, the Bean Team and USG think it would be best if they were made part of the campus in some way. “We’re going to ask each member or club which location on campus is favorable to them and try and get it in there,” said Harabasz. Although she is a biology and psychology major, she joined the Bean Team to stay involved in the art community. “I just wanted to share art with different people instead of just keeping it to myself,” she said. Harabasz was happy to bring art, something she is very passionate about, to the broader campus community. “I can get lost for hours with my art projects and it is when I am my happiest,” she said. Harabasz hopes that this exhibit will make students more aware of the Benton, what she calls a “cultural hub” where you can always come back and see something new. The exhibition will be on display until February 19th– and this week will be the last week you can vote for your favorite with slips located near the display cases (Both the artists and those who vote have a chance to win prizes!) Make sure you don’t miss your chance to see it- and perhaps be inspired to check out the Benton Museum’s current exhibits or get involved in upcoming events! Hi everyone! My name is Sarah, a student blogger for the library. I am a senior studying communication and journalism. Like many of you, I have spent countless nights holed up in Homer Babbidge Library, subsisting solely on snacks and coffee from Bookworms Café. However, the library is way more than just a study spot, and I think many students don’t realize everything the library has to offer. Library staff members work to put together many programs that can help you succeed in your academics and improve your experience on campus. There are resources that can help you in every step of the academic process. 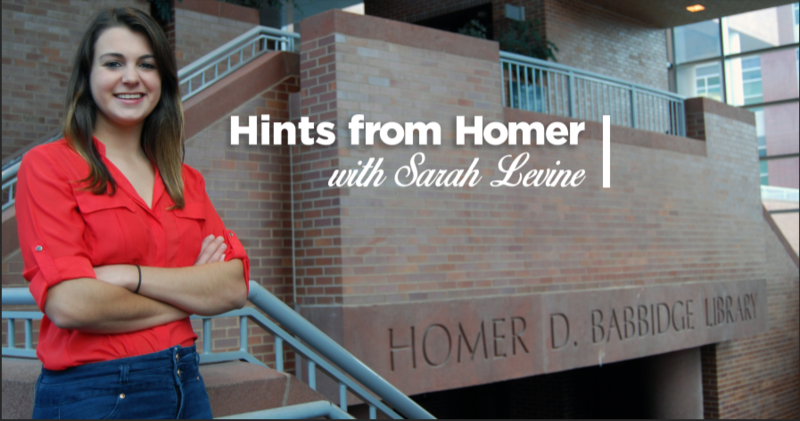 From research specialists dedicated to helping you find sources in your subject area, to the diverse exhibits adorning different areas of the building, a lot of thought goes into every aspect of good ol’ Homer. This blog serves to let UConn students know about all the technology, programs, events and assistance available to them at the library. 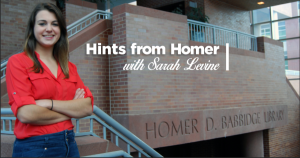 Check out my “Hints from Homer” posts on this site to see what you may have missed! Enjoy the last couple of weeks before finals!